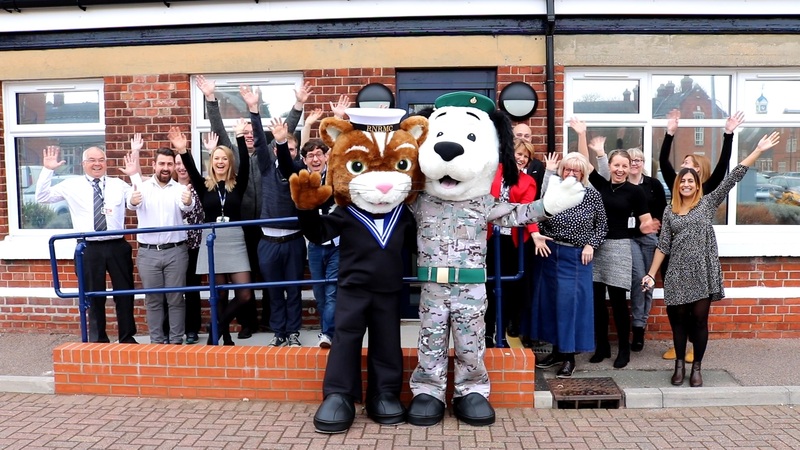 Name the RNRMC mascots Our two brand new life-sized mascots have arrived and we need your help with deciding on the permanent name of both the Royal Marines dog and the Royal Navy cat. 2. By submitting your entry you accept these rules. 3. Employees of the RNRMC and their immediate families may enter. 4. The competition is open from 22/03/2019 midday GMT until 21/04/2019 midday GMT. 5. We may refuse or disregard your entry for any reason. d) You indemnify and hold RNRMC harmless for damages resulting from infringement, breach of warranty or breach of contract caused by RNRMC use of the entry. 8. Apart from souvenirs and prizes offered as part of the competition, no monetary compensation will be paid for the entry and any of your competition entries. 9. RNRMC is not responsible for competition entries not received due to lost, failed, delayed or interrupted connections or miscommunications, or other electronic malfunctions. RNRMC is not responsible for incorrect or inaccurate entry information, whether caused by you or any other persons or by any of the equipment. 10. RNRMC may select winners at its sole discretion. RNRMC has no obligation to publish or disclose to you the basis or reasoning for the selection. 11. If the competition entrant is under the age of 18, please use the details of a parent or guardian with their concent. Please fill in contact details and preferences below. If the competition entrant is under the age of 18, please use the details of a parent or guardian with their concent.